Many think about Pirhana fish as a specie of fish that spread terror in the Amazon jungle and that devours everything that is unfortunate enough to come in their path in a matter of seconds. The only truth to be found in that belief is the fact that pirhanas do indeed live in South America and the Amazon River system. The rest is pure fiction or extreme exaggerations. The truth is that pirhanas is a name used for a number of fishes within the subfamily Serrasalminae and only a few of those are predators. Many pirhana species survives by eating vegetables and other are specialised to only eat certain parts of fish such as eating fins. These species feed of other fish without killing them and bits of small fin pieces from a lot of different fish thereby leaving the prey fish virtually unharmed and the fin eventually grows back again. There are however some small truth behind the myth of the killer Pirhana. The predatory species, those who have been the basis for the myth mainly eat fish but they do sometimes eat mammals during the dry season if the have in large numbers have been captured in small bodies of water where the food supply have been used up. They are under these conditions able to like the myth says tear the flesh from the bones in a matter of seconds, or more often in minutes. However during more normal conditions and during the wet seasons the pirhanas are spread over far greater areas in the flooded jungle and posses no life threatening threat to humans and other larger mammals. The fact is that Pirhana species has much more reason to fear humans since they are appreciated food fishes in the Amazon area due to the fact that they taste good and are easy to catch in the entire region which makes them perfect food while travelling in the jungle as well as in everyday life. 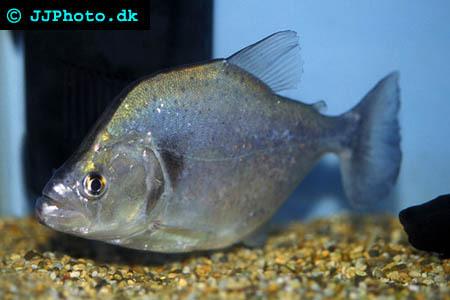 Pirhanas are easily kept in aquariums but are best kept in aquarium solely dedicated to housing pirhanas. The vegetable eating species are suitable for large community aquariums. I recommend that you read everything you can find about keeping pirhana fish in an aquarium tank before purchasing one just to find out that you cant give it the environment it need when it starts to grow and put higher demands on the aquarium owner.